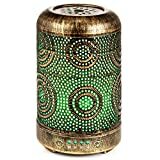 This diffuser for essential oils has a strong build quality with iron metal shell & PP water tank. 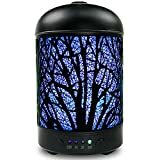 It has a great-looking FOREST design is more unique as compared to other plastic diffusers. 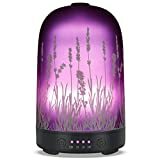 Essential oil diffuser's ultrasonic function to diffuse oil works quietly to provide a continuous mist for 3-5 hours. It has 4 time setting mode:0.5H/1H/2H/3H for your different needs. The diffuser light offers 7 color options, which can either cycle or be locked onto one color. The light itself isn't particularly bright, so it could serve as an effective night light without disrupting sleep. 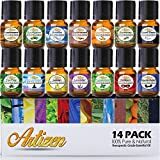 Arvidsson essential oil diffuser offers 1 year warranty, which ensures that, if you're one of the unlucky few that get a defective product, we will send you a replacement at no cost and with no hassle. 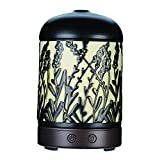 Press the Power button, to turn on the diffuser, then press again to set the time from 0.5 hour/1 hours/2 hours/auto-mist. Press the Light button to turn on the LED light, the color will change automatically. 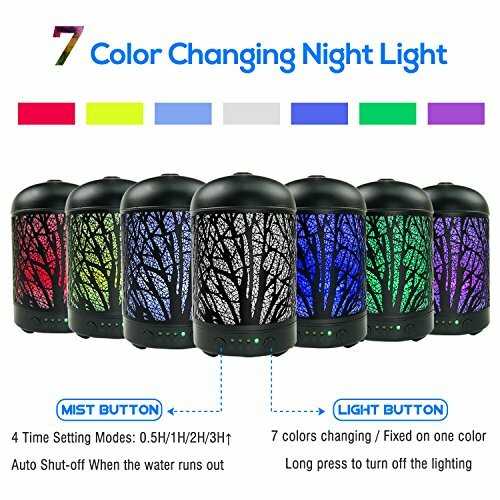 Press the Light button again to freeze the color you want or change to another color, 7 color is available.